Both the Hubby and I love navy beans. They are so creamy, meaty, and soak up flavor. I had made navy beans baked with lamb roast, on a rack over top of the beans, a few years ago. The drippings combined with the beans and herbs and made an amazing sidedish. I was planning on roasting some turkey thighs and thought something similar would come out just as tasty. 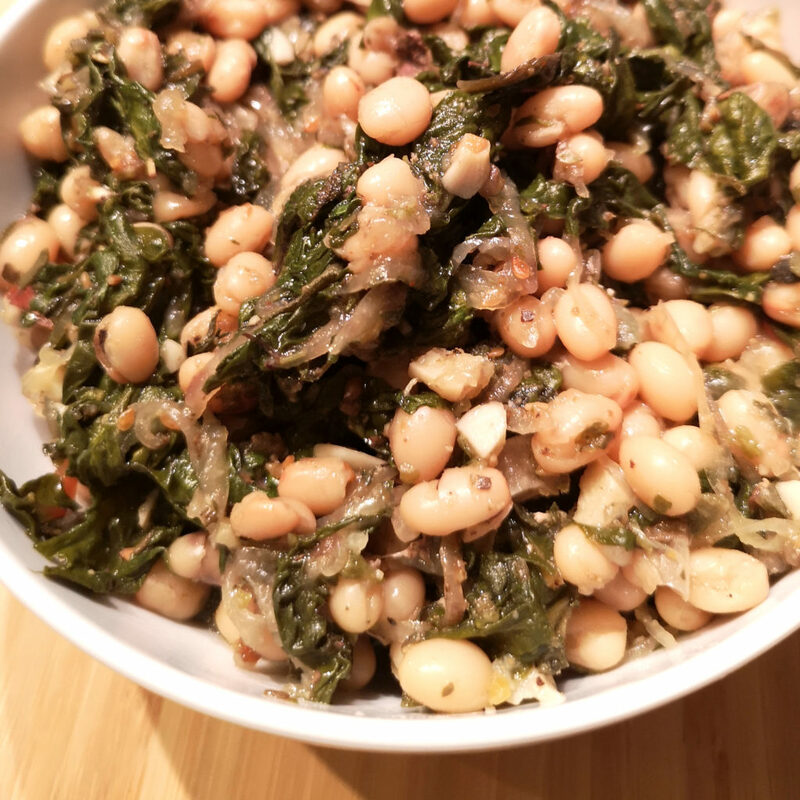 I used navy beans and swiss chard, but I believe spinach would work just as well. The key is to place a rack with your meat over the beans. This allows for any drippings to mix with the beans, adding even more flavor! With this recipe, I had baked it for 1 hour and 40 minutes, for the lamb it was over a couple hours. Both cooking times worked for the beans, they didn’t get overly mushy. They did get soft, but because they aren’t being messed with or stirred, kept their shape. When I served it, I actually dumped it through a strainer so the mixture wasn’t soggy. Next time, I will keep the liquid! The reason? The leftover mix made for a kickass turkey and bean soup the next day! Line a roasting pan with tinfoil and preheat the oven to 350°F. Peel the onion, cut in half and slice thinly. Place in the roasting pan. Wash the swiss chard, remove the stems, rough chop the leaves and add to the roast pan. Take the fresh herbs, strip off their stems, chop small and add to the roasting pan. Add the navy beans (including the liquid), the stock, and spices to the roasting pan. Mix everything together. At this point, place the rack for the turkey on top and then the meat. Bake for approximately 1 hour and 40 minutes (until the turkey temperature of 165°F. I have cooked navy beans in this method with lamb, for over 2 hours, with no harm done.